Cerebrospinal fluid (CSF) is thought to flow into the brain via perivascular spaces around arteries, where it mixes with interstitial fluid. The precise details concerning fluid outflow remain controversial. Although fluid dynamics have been studied in the brain, little is known about spinal cord fluid inflow and outflow. Understanding the normal fluid physiology of the spinal cord may give insight into the pathogenesis of spinal cord oedema and CSF disorders such as syringomyelia. We therefore aimed to determine the fluid outflow pathways in the rat spinal cord. A fluorescent tracer, Alexa-Fluor®-647 Ovalbumin, was injected into the extracellular space of either the cervicothoracic lateral white matter or the grey matter in twenty-two Sprague–Dawley rats over 250 s. The rats were sacrificed at 20 or 60 min post injection. Spinal cord segments were sectioned and labelled with vascular antibodies for immunohistochemistry. Fluorescent tracer was distributed over two to three spinal levels adjacent to the injection site. In grey matter injections, tracer spread radially into the white matter. In white matter injections, tracer was confined to and redistributed along the longitudinal axonal fibres. Tracer was conducted towards the pial and ependymal surfaces along vascular structures. There was accumulation of tracer around the adventitia of the intramedullary arteries, veins and capillaries, as well as the extramedullary vessels. A distinct layer of tracer was deposited in the internal basement membrane of the tunica media of arteries. In half the grey matter injections, tracer was detected in the central canal. These results suggest that in the spinal cord interstitial fluid movement is modulated by tissue diffusivity of grey and white matter. The central canal, and the compartments around or within blood vessels appear to be dominant pathways for fluid drainage in these experiments. There may be regional variations in fluid outflow capacity due to vascular and other anatomical differences between the grey and white matter. Details of the circulation of cerebrospinal fluid (CSF) and interstitial fluid (ISF) of the central nervous system remain controversial [1, 2]. In recent decades, the concept of CSF circulating through the brain parenchyma, as a mechanism for metabolite transport and clearance [1–4], has gained momentum. ISF consists of water and solutes that are the by-products of cellular metabolism and synaptic transmission in the extracellular space. There may even be a component of ISF that passes across the brain capillary endothelium (although compelling in vivo evidence is contentious) [4–8]. Perivascular spaces have received renewed interest as a crucial facilitator of fluid inflow in neural tissue [9–13]. If CSF can enter brain parenchyma, there must also be efflux pathways . The assumption is that ISF must be cleared, probably into the subarachnoid space [14, 15], but the precise mechanism is unclear. The “glymphatic” theory of fluid homeostasis posits that fluid flow into and out of the parenchyma is via arterial and venular pathways respectively [10, 16, 17]. Studies to date have largely focused on the brain, with few investigations of spinal cord. Although there is some evidence of similar mechanisms governing fluid ingress [18–20], how fluid egresses from the cord is almost unknown [21, 22]. Compared to the brain the spinal cord is not only much smaller, but the arrangement of the grey and white matter is reversed. Furthermore, spinal cord axonal tracts are oriented parallel to its long axis. These fundamental anatomical differences mean diffusion and transport of fluid in grey and white matter are likely to be different [3, 14, 23]. Syringomyelia is a puzzling condition where fluid filled cysts develop in the spinal cord, usually secondary to another pathology, such as trauma, that results in CSF obstruction in the subarachnoid space. There is emerging evidence that its pathogenesis is a dynamic process involving imbalances in fluid inflow and outflow. The important contribution of perivascular spaces to mechanisms of fluid entry into syrinxes has been characterised in previous animal experiments [19, 24, 25]. Recent work  on fluid outflow pathways in an ovine model of post-traumatic syringomyelia indicated diffuse fluid movement away from the syrinx cavity and towards the central canal and perivascular spaces. However, the precise pathways of fluid drainage in the spinal cord under normal physiological conditions, and whether perivascular spaces play a crucial role in this context are unknown. A more complete understanding of the mechanisms governing spinal cord fluid homeostasis may lead to new insights into the pathogenesis of syringomyelia. In this study, we aimed to determine the fluid outflow pathways in the rat spinal cord. We injected a fluorescent tracer of the extracellular space, ovalbumin conjugated to the fluorophore Alexa-Fluor®-647 (AFO-647), into the spinal grey and white matter of Sprague–Dawley rats. Our hypotheses were: (1) fluid outflow from the spinal cord is via the perivenular spaces; and (2) the pattern of fluid flow in the white matter is different from that of grey matter. Ethics approval was obtained from Macquarie University Animal Ethics Committee (ARA 2016/032–5). Outflow from the grey and white matter was separately investigated at two time points in 22 male Sprague–Dawley rats, weighing from 155–345 g. Ten animals were used in the white matter injection studies, while 12 were used in the grey matter injection studies. After induction of general anaesthesia with 4% isoflurane in oxygen, the animal was positioned prone in a stereotactic frame, and maintained under anaesthesia with 2.5% isoflurane (adjusted as necessary) in 0.2 L/min of oxygen. Heart rate, oxygen saturation, respiratory rate and rectal temperature were continuously recorded. Under an operating microscope, a dorsal midline occipitocervical incision was made followed by subperiosteal muscle dissection. Segmental laminectomies at C7/T1 or T1/T2 were performed with fine rongeurs. A window of thecal sac, eccentric to the right, was exposed. A 34G Nanofil needle, loaded onto a glass syringe (World Precision Instruments, Florida, USA), punctured the dura in a single pass. For grey matter studies, the entry point of the needle was 0.5 mm right of the midline at the C7/T1 interspace. For white matter studies the entry was at least 1 mm right of the midline at the T1/T2 interspace, where the grey matter is less prominent. The needle passed into the parenchyma to a depth of 1 mm targeting either the junction of the ventral and dorsal horns (for grey matter injections), or the lateral white matter funiculus. An Ultramicro pump (World Precision Instruments, Florida, USA) was used to deliver 500 nL of Ovalbumin Alexa-Fluor®-647 conjugate (Life Technologies, Victoria, Australia) with 10% fluorescent microspheres (v/v %) (Thermo Fisher Scientific, Massachusetts) at a rate of 2 nL/s. The needle was left in situ for either 20 or 60 min from the start of the injection. By either the 20 or 60 min time point, the animal underwent transcardiac perfusion with heparinised 0.1 M phosphate buffered saline (PBS) followed by 4% paraformaldehyde (PFA) (Lancaster Synthesis, Pelham, New Hampshire). 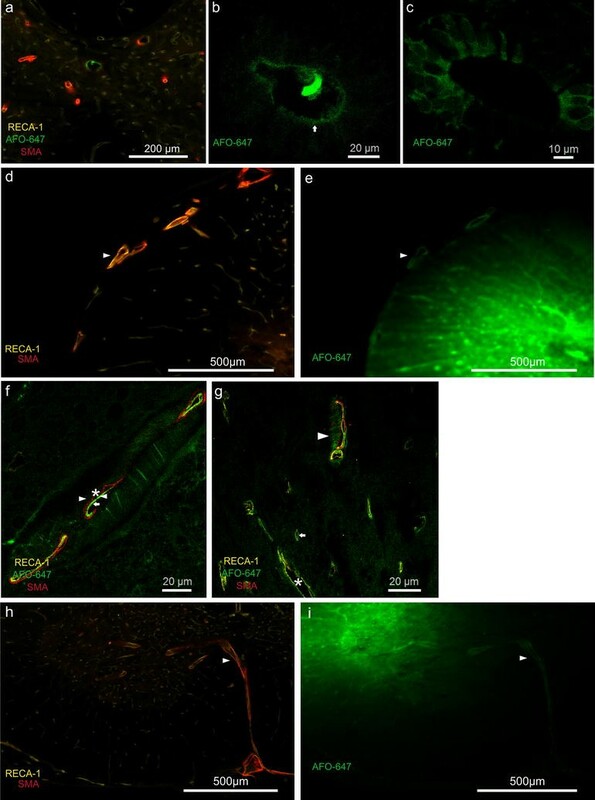 The spinal cord and brain were harvested en bloc for macroscopic fluorescent imaging. After post fixation in 4% PFA overnight, the specimen was stored in 30% sucrose for cryoprotection. The spinal cord was segmented from C2 to T4. Each segment was snap frozen, and 40 µm axial sections were taken on a cryostat and mounted onto glass slides. The glass slides were washed twice for 10 min in tris–phosphate buffered saline, and then in 50% ethanol for cellular permeabilization. After application of 15% normal donkey serum (NDS) blocking solution, the slides were incubated overnight with 1:100 Rat Endothelial Cell Antibody (RECA-1, Abcam, Cambridge, United Kingdom) in 4% NDS. The secondary antibody, 1:400 anti-mouse IgG Alexa-Fluor®-488 (Molecular Probes, Life Technologies, New York, USA) was then applied. This was followed by anti-actin α-smooth muscle antibody at 1:400 dilution (SMA-Cy3, Sigma-Aldrich, St. Louis, Montana). Primary and secondary controls were established to exclude autofluorescence. The slides were cover-slipped with fluorescent mounting medium (DAKO, NSW, Australia). 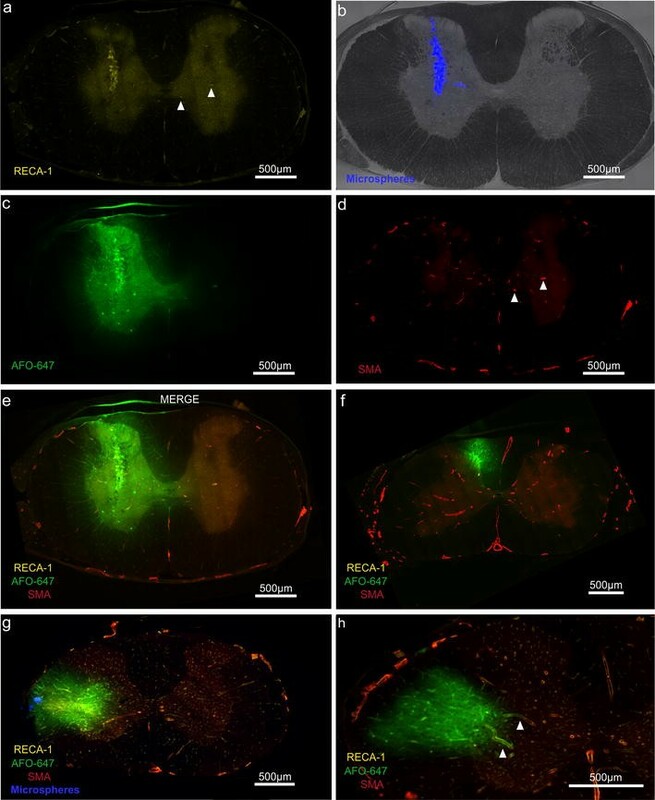 After post fixation, macroscopic white-light and single channel fluorescent images were captured with the in-vivo MS FX PRO (Bruker, Billerica, MA). The fluorescence camera was set at excitation and emission wavelengths of 630 and 700 nm respectively, with an exposure time of 4 s.
Spinal cord axial sections from C2 to T4 were imaged with a Zeiss Axio Imager Z1 fluorescence microscope (Carl Zeiss Microimaging GmbH, Germany) for qualitative and quantitative analysis. The fluorescent microspheres, which have a diameter of 1 μm, were used to verify the location of the injection site as their size prevents significant displacement. SMA- and RECA-1-positive vessels were identified as arterioles. SMA-negative, RECA-1-positive vessels were designated venules or capillaries. Those with largest diameter ≥ 6.5 µm were considered venules, and those < 6.5 µm capillaries. Further delineation of vascular and anatomical structures was undertaken with confocal microscopy (LSM 880, Carl Zeiss Microimaging GmbH, Germany). Quantitative analysis of fluorescent signal intensity was performed using Image J, version 1.46r . Subtraction of background fluorescence was performed in all measurements. In macroscopic fluorescent acquisitions, the spinal segment levels were identified by counting nerve roots on the white light images (Fig. 1a). These were then overlaid onto the fluorescence images. Mean pixel densities were measured in each spinal segment from C2 to T4 to yield fluorescence intensities. In fluorescent photomicrographs of axial sections, the integrated density of the tracer (mean pixel density multiplied by area) was calculated. The mean pixel densities of the white and grey matter were measured separately. At least three sections were analysed per spinal level from C2 to T4, and then averaged to give a mean integrated density. Grey matter and white matter integrated densities were compared using two-way analysis of variance (ANOVA) and adjusted for multiple comparison using Bonferroni’s post hoc tests (GraphPad Prism v7.02, GraphPad Software Inc, California). A p value < 0.05 was considered statistically significant. All values were expressed as mean ± standard error of the mean (SEM). In macroscopic fluorescent imaging, tracer was observed to be localised to the injection site in all experiments (Fig. 1b). The macroscopic mean fluorescence intensity was determined for each spinal cord level. A sharp drop-off in intensity within two levels rostral and caudal to the injection site was observed (Fig. 2). At the 60 min time point, but not at the 20 min time point, the cord had significantly higher mean fluorescence intensities after white matter injections (WMi) compared to grey matter injections (GMi) (two way ANOVA, p = 0.0026). On post hoc analysis, significance was reached one and two levels rostral to the injection point (p = 0.045 and 0.026 respectively) (Fig. 2b). Post hoc analysis also demonstrated a significant difference between white and grey matter injections at the 20 min time point one level caudal to the injection site (p = 0.034) (Fig. 2a). Quantification of AFO-647 intensity from microscopic analysis of axial sections is summarised in Fig. 3a–d. The fluorescence intensity within the grey and white matter, expressed as integrated density, is represented in relation to spinal level at the 20 and 60 min time points separately. After white matter injections, at both 20 and 60 min, fluorescence was significantly greater in the white matter compared to grey matter (p = 0.0094 and 0.0041 for 20 and 60 min respectively) (Fig. 3c, d). On post hoc analysis, at the 20 min time point, a significant difference was observed at one level caudal to the injection site (p < 0.0001). At 60 min, white matter fluorescence was found to be significantly greater one level rostrally (p = 0.0017) and caudally (p < 0.0001). Following grey matter injections, however, tracer fluorescence was not significantly different between grey and white matter, at either time point (Fig. 3a, b). In six of 12 animals, in which grey matter injections were performed, tracer was delivered to the junction of the ventral and dorsal horns. There was a continuous radial decrease in fluorescence intensity in all directions away from the injection site. Tracer signal was detected in the white matter surrounding the grey matter at the injection level (Fig. 4e). In rostral and caudal axial sections, tracer was detected predominantly in the grey matter. In the other six animals, in which grey matter injections were performed, tracer was delivered into either the middle of the ventral or dorsal horn. Although the highest fluorescence intensity was found within the grey matter, there was substantial tracer signal in the adjacent white matter. In rostral and caudal sections there was prominent tracer signal in the white matter (Fig. 4f). In all but one animal, tracer was detected in the contralateral grey matter. In eight of 10 animals the distribution of AFO-647 conformed to the shape of the lateral funiculus, staying primarily in the white matter (Fig. 4g). A radial reduction in tracer fluorescence was also observed. A small amount of tracer entered the lateral horn of the grey matter. Rostrocaudally, ovalbumin was almost exclusively found in the white matter (Fig. 4h). Within this subgroup of animals, no tracer was detected in the contralateral grey matter except in one animal. In two of 10 animals, there was a similar pattern of tracer spread in the white matter but considerable ovalbumin also redistributed into the grey matter. Rostrocaudally, however, tracer was confined to the white matter. In all animals fluorescent tracer accumulated around or within the walls of arterioles, venules and capillaries in both the grey and white matter (Figs. 5, 6g). Arterioles were more numerous in the grey matter than the white matter (Fig. 4d). Selective tracer labelling of vascular structures was particularly evident in areas of low background tracer concentration (Fig. 5a, d). In the white matter, tracer concentrated along arterioles and venules that extended from the grey matter to the pia (Fig. 5d). 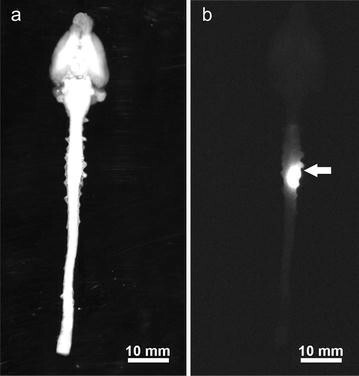 Tracer co-localised with arterioles and venules of the ventral median fissure in all but one animal (a white matter injection, sacrificed at 20 min) (Fig. 5d, f, h). Tracer was present in the wall of the anterior spinal artery (ASA) and its central branch in 10 animals (Fig. 5d), of which nine were grey matter injections. Fluorescence was further present in the walls of the arterial vasocorona in 13 animals (Fig. 6d–f), of which 10 were white matter injections. Confocal microscopy demonstrated tracer deposition external to the smooth muscle layer of the ASA. Additionally, there was a distinct layer of tracer between the endothelial and smooth muscle layers (Fig. 5e). This pattern of tracer distribution was also observed in parenchymal arterioles and other extramedullary arteries, such as the central branch of the ASA and the arterial vasocorona. AFO-647 was discretely deposited external to the endothelial layer of capillaries and venules of the cord parenchyma (Figs. 5h, i, 6g). In at least six animals (two from white matter injections), tracer deposited prominently around “remote” arterioles (Fig. 5f, g). These labelled vessels were far removed from the bulk of the contiguous tracer at the injection site. Tracer labelling of the pia and subpial space was generally limited or absent as fluorescence intensity decreased from the site of injection towards the cord surface. Instead, ovalbumin concentrated around vessels that traversed the cord parenchyma towards the pial surface. Tracer appeared to be transported from the injection site to the extramedullary vasculature (Fig. 6i), along these conduit-like arterioles and venules. Fluorescent tracer was detected in the central canal ependymal cell layer in 6 of 12 grey matter injections. In three animals, central canal tracer fluorescence was present in at least eight contiguous spinal levels, rostral to the injection site. Furthermore, tracer was observed within the lumen of the canal, confirmed by confocal microscopy. The bordering layer of ependymal cells was heterogeneously delineated by fluorescence. Nuclear labelling by tracer was absent. The apical ends displayed greater tracer intensity compared to the basal surface (Fig. 6a–c). In two animals, central canal ependymal tracer was detected rostrally over only 2 spinal levels. In one animal, tracer extended caudally only from T1 to T4. No tracer was found in the central canal in any of the white matter injection animals. Figure 7a–d compares tracer fluorescence intensity in both the white and grey matter at the 20 min time point to that of the 60 min group. The same data derived from the quantification of axial tracer fluorescence was used to assess the effect of time on tracer distribution. There was no statistically significant difference in the grey matter fluorescence intensities between the two time points after either grey or white matter injection (Fig. 7a, b). However, on post hoc analysis significantly greater grey matter fluorescence was observed at one spinal level rostral to the white matter injection site after 60 min compared to 20 min (p < 0.0001). There was no overall significant difference in the white matter fluorescence intensities between the two time points after either grey or white matter injections. Post hoc analyses demonstrated significantly higher white matter fluorescence at 60 min compared to 20 min at one level caudal (p = 0.009) and one level rostral (p < 0.0001) to the injection site following grey matter and white matter injections respectively (Fig. 7c, d). At the longer time point, it appeared that after white matter injections there was greater redistribution of tracer from the white matter into the grey matter, and also along white matter tracts rostrally. After grey matter injections, there also appeared to be greater tracer spread into the lateral white matter caudally with time. In this study, the distribution of fluorescent tracer up to 60 min after injection into the spinal cord interstitium was limited to the adjacent two to three spinal cord levels. Tracer was distributed in a radial pattern after delivery into the grey matter, with dissemination into white matter. The absence of statistically significant differences between tracer fluorescence intensities of the grey and white matter after grey matter injections (Fig. 3a, b) is consistent with this observation. However, there was limited redistribution of tracer from white into grey matter after white matter injections. The statistically significant differences between grey and white matter tracer fluorescence intensities after white matter injections support this observation. There was some evidence these patterns were amplified over time. Greater spread of tracer along white matter tracts longitudinally was also observed. There was prominent labelling of all vascular structures by AFO-647. Tracer appeared to be conducted away from the injection site towards the pial surface by depositing around radially projecting arterioles and venules. Support for this inference was provided by the detection of tracer fluorescence around extramedullary vessels. This finding was unlikely to have been secondary to diffusion (or other means of contiguous solute transport such as bulk flow) of tracer because of the general absence of subpial fluorescence (Fig. 6e, i), particularly after grey matter injections. Further microscopic analysis revealed accumulation of ovalbumin both in the perivascular and paravascular spaces of arterial vessels, which will be discussed below. Although it was not possible in this study to conclude whether diffusion or bulk flow governed interstitial tracer movement, our findings are in concordance with theoretical and animal models of spinal ISF movement from other groups. Confinement of tracer to white matter tracts is characteristic of anisotropic diffusion, well described in the literature on CNS diffusion tensor imaging , and has been confirmed in the developing rat spinal cord in ex vivo experiments [28, 29]. Here, fluid diffuses along, and is constrained by, myelinated white matter fibres that run parallel to its long axis. The unmyelinated grey matter, however, is the site of penetrating arteries and its extracellular space (ECS) is rich with somas and neurites that have no preferential orientation. Diffusion here is isotropic which may explain why in our experiments tracer in the grey matter was able to redistribute in all directions. Convection enhanced delivery (CED) studies in animal spinal cord have yielded similar findings of anisotropic movement of ligands through the white matter tracts [30, 31]. Endo et al. , employing Evan’s blue tracer, observed comparable results to ours but described almost no tracer penetration into grey matter after white matter injections. Moreover, Evan’s blue tracer was redistributed further rostrocaudally from the injection site in the white matter compared to the grey matter. These differences could be secondary to the larger delivered volume of tracer (2 µL) in their experiments, and the smaller molecular size of Evan’s blue compared to ovalbumin. Like other CED models and earlier ex vivo work on spinal cord ISF movement [14, 28, 30–34], in Endo’s study a large durotomy was performed, resulting in substantial CSF leak and altered hydraulic integrity of the subarachnoid space and perivascular spaces, which may in turn alter fluid inflow dynamics. Computational simulation of the rat spinal cord by Sarntinoranont et al. yielded a lower hydraulic conductivity in the grey matter and thus increased tissue resistance. They showed that diffusion of macromolecules through ECS is limited by tortuosity (higher in grey matter) and efficacy of diffusion diminishes as the square of distance. Diffusion along ECS is unaffected by these factors [1, 36]. This would account for the greater penetration of tracer from grey to white matter (compared to white to grey matter) in this study, and the higher fluorescence signal rostral to the injection site observed at 60 min in white matter injections (Fig. 2b). It may also explain the apparent increase in white matter fluorescence after white matter injections at 60 min compared to 20 min, and the absence of this in the grey matter after delivery of tracer into the grey matter (Fig. 7a, d). Various authors have used the terms “Virchow-Robin space”, “perivascular space” and “paravascular space” interchangeably, but also at times to refer to discrete anatomical compartments. A comprehensive review of the ultrastructure of the “perivascular” space is beyond the scope of this article, but readers are referred to excellent treatises by Bakker et al. and others [3, 38–40]. For our purposes, we distinguish the “peri-arterial space”, which consists of multiple compartments within the pial sheath that accompanies the arteriole/artery as it enters the CNS parenchyma, from the “para-arterial space”. The latter is the space formed by the glia limitans and the pial sheath of the penetrating artery. The “para-venular space” is formed by the venular adventitia and the glia limitans. Collectively the “para-arterial” and para-venular” spaces form the paravascular compartment. Henceforth, “perivascular space” loosely refers to all the compartments between vessel and glia limitans. These descriptions have been derived from brain studies [2, 3, 37, 38]. Ultrastructural studies of the rat spinal perivascular space suggest similar anatomy . There is compelling evidence from our study supporting the importance of the vascular basement membrane in fluid outflow in the spinal cord. Controversy still surrounds the relationship of CSF, ISF and perivascular flow in the brain. There are two prominent contemporary theories of brain perivascular flow—the “glymphatic” system [10, 42] and a vascular basement membrane model . The former was borne out of experiments on transgenic mice where intraventricular, intracerebral, and intracisternal injections of CSF tracers established CSF inflow into brain via a “para-arterial” route, bulk interstitial flow, and “para-venous” outflow. Other groups later raised concerns regarding the methodology and interpretation of observations [2–4, 8, 43–46]. The Carare–Weller group has long promulgated that fluid influx is via the para-arterial space and clearance of solutes and ISF occurs via the “peri-arterial” vascular basement membrane found within the tunica media. Their model has been backed by experiments from their own laboratory [11, 38, 47, 48] and from other groups employing intravital multiphoton microscopy . They also assert that at the level of the capillaries, there is adjacent bidirectional flow of fluid, with inflow occurring adjacent to the glia limitans, and outflow of ISF occurring next to the endothelium. Notably, there is no venular involvement in fluid transport. The major points of dissent are: (1) the types of vascular structure(s) that are involved in ISF and solute egress; and (2) the precise relationship of the outflowing fluid to the various compartments surrounding these vessels. In this study, confocal microscopy demonstrated the presence of tracer not only in the “para-arterial” and “para-venular” spaces, but also in the “peri-arterial” compartment. It appeared that arterioles, venules and even capillaries are implicated in fluid outflow, and hence elements of both dominant theories (that are based on brain studies) have relevance in the spinal cord. Moreover, the vascular basement membrane (as proposed by Carare–Weller) has been shown here to play an important role in solute clearance in the spinal cord, which in turn suggests ISF outflow occurs both within and outside the wall of the arteriole. While injection pump pressure could confound our interpretation of interstitial perivascular tracer deposition, it is unlikely to explain tracer accumulation around only some extramedullary vessels and “remote” arterioles that are far removed from the bulk of the tracer. Moreover, our infusion rate of 0.12 µL/min is lower than that employed by other groups [3, 50], and thus is unlikely to alter the physiological drainage pathways. Uniform perivascular distribution of tracer around the spinal pial surface, which has been previously observed following cisterna magna injections [20, 41], was not detected in our experiments. Therefore, accidental delivery into, or recirculation of tracer from the cord back into the subarachnoid space are highly improbable. Our findings raise the possibility of a model of spinal perivascular fluid dynamics characterised by rapid bidirectional movement. Some authors have suggested that there is little or no directed net fluid displacement in the perivascular space, a concept that aligns with earlier experimental data [2, 51]. A recent mathematical modelling study proposed that although there might be fast water movement to-and-fro in the perivascular space, solute transfer is facilitated by advection or dispersion . Dispersion is in turn driven by arterial pulsations, which authors of disparate theories can all agree underlie the mechanism of perivascular flow [11, 16, 18, 52]. Additionally, solutes may freely communicate between the “para-arterial space” and the “peri-arterial” space through porous barriers that have been confirmed in ultrastructural studies of the spinal cord [2, 39, 41]. If this “convection”  theory of bidirectional fluid displacement also applies to the “para-venous” space, then tracer molecules injected into the cord parenchyma would disperse along both arteriolar and venular pathways by way of the capillaries . Initially, there is “peri-arterial” drainage of solutes via the vascular basement membrane, but tracer is then able to infiltrate the “para-arterial” space. As pulsations are much stronger in arteries, tracer is propelled further along arterioles (towards the extramedullary arteries) compared to venules. This is reflected in the preponderance of tracer around extramedullary arteries and “remote” arterioles. However, we would also expect greater “para-venular” tracer deposition at 60 min compared to 20 min. This was, however, not observed, challenging this conjecture on perivascular fluid outflow. Future studies would mandate longer time points to investigate para-venular tracer distribution. Central canal labelling by tracer was detected in 50% of grey matter injection experiments, with a predilection for rostral migration. This corresponds to the earlier observation by Milhorat  of cephalad flow within the central canal, which gave rise to the theory that it acts as a “sink” for excess solutes and fluid from the cord interstitium. Previous work by our group and others has indicated that the central canal is a route of clearance in normal and injured rat and ovine cords [18–20, 24–26, 53, 54]. Bedussi et al. have suggested that in the brain, ISF drains preferentially towards the ependymal surface. However, this was only true in close proximity to the ependymal lining and the effect decreased away from the ventricles . In the spinal cord the distance between the ependymal and pial surfaces is much smaller, so the relevance of this hypothesis is unclear. A more likely explanation for the disparate central canal labelling between grey and white matter injected animals is that diffusivity differences (which in turn are dependent on factors such as tortuosity and distance) at the grey/white matter junction result in the central canal playing a critical role in fluid outflow from the grey matter. 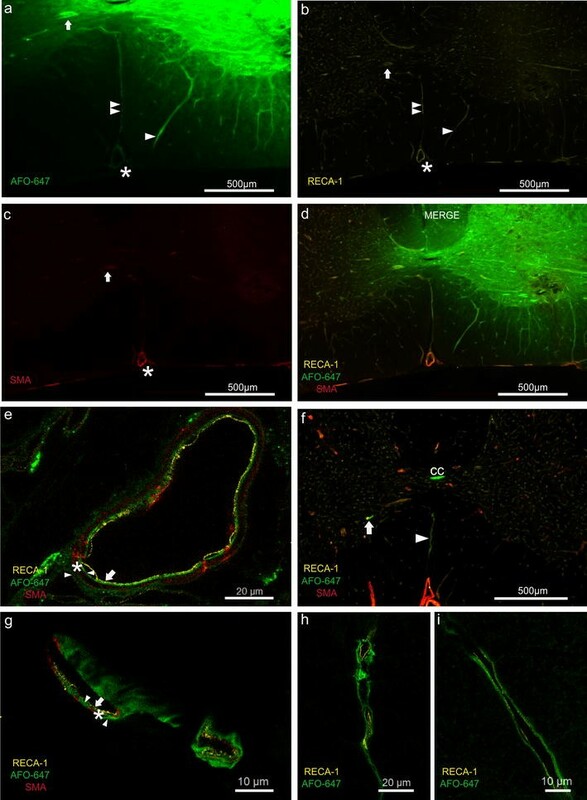 It was not possible to clarify, based on confocal micrographs, whether tracer migration into the central canal was transcellular, paracellular or both. Further ultrastructural studies may address this. Findings from these experiments may contribute to a clearer understanding of various spinal cord pathologies. Although outflow pathways have been shown here to involve all vascular structures, there may be regional variations. In the spinal grey matter, there is prominent drainage of solutes and ISF via the numerous ramifying arteries from the ventral median sulcus, as well as into the central canal. In the white matter, outflow efficiency may differ as there are fewer arterioles, and greater reliance on the smaller arterial vasocorona. Extrapolating further, extra-canalicular syringomyelia (a consequence of spinal cord injuries) may be partly precipitated by pathological processes disproportionately compromising ISF drainage via white matter perivascular spaces. Outflow is unable to keep up with fluid influx, ultimately leading to fluid accumulation. Similarly, this may partially explain why spinal cord oedema preferentially follows white matter tracts, as in the grey matter there may be more robust drainage pathways. As some authors have emphasized  that for maintenance of perivascular bulk flow the hydraulic parameters of the subarachnoid and perivascular spaces cannot be compromised. Although CSF losses were not observed during injections in this study, small leaks cannot be ruled out and may account for the relatively limited longitudinal displacement of ovalbumin, and the absence of statistical significance in tracer redistribution between 20 and 60 min. The apparent lack of tracer displacement between the two time points could also be explained by the possibility that these experiments were, at least partially, an investigation of spinal convection enhanced delivery. Other groups have noted that in CED studies, spinal cord injury results in migration of tracer across the grey–white border . We used the smallest calibre needle possible, but there was still some evidence of local parenchymal trauma due to the cyclical movements of respiration. Unlike in Endo’s study where Evan’s blue did not cross the grey/white junction after white matter injections, tracer in this study was not completely contained within white matter at the level of injection. As with other tracer studies, labelling of the “pial glial” layer and the smooth muscle basement membrane may be explained by selective binding of tracer or by a sieving effect . Fluid passage within the dorsal white columns was not directly investigated. As this area is isolated from the rest of the white matter the pattern of fluid outflow could theoretically be different. In future investigations of spinal cord fluid outflow, longer experimental time points are recommended. This would validate some of the observed differences between grey and white matter tracer distribution patterns. It may also provide insight into whether spinal CED was actually investigated in these experiments, as well as the role arterial pulsations might play in driving tracer outflow—para-venular tracer deposition may increase with time (see above). It was not possible to quantify the amount of tracer outflow via the various pathways due to the semi-quantitative nature of our results. Finally, these findings were obtained in anaesthetised prone small animals and extrapolation of these findings to upright large mammals should proceed cautiously as volatile anaesthetics are known to alter cardiovascular parameters and CSF production, which in turn affects CSF hydrodynamics . This study investigated the pattern and pathways of fluid outflow in the rat spinal cord. Our results suggest interstitial fluid is transported radially in the grey matter, and along the parallel axonal fibres in the white matter. Fluid outflow appears to be limited predominantly to a few spinal segments after 60 min. Paravascular and perivascular pathways, including both arterial and venous routes, likely play important roles in fluid efflux. The precise mechanisms by which the vascular basement membrane of arteries act as a conduit for fluid and solute drainage from the spinal cord warrants further investigation. There may be regional variations in fluid outflow pattern within the spinal cord due to the presence of the central canal and differences between grey and white matter in vascular anatomy. These results suggest interstitial fluid dynamics are more complicated than that described by the glymphatic model. MAS and LEB conceived the original idea; MAS, LEB, SL and MAL experimental design; MAL, SL, SJH, AS, conducted the experiments at Macquarie University. SL analysed the data. SL interpreted the results of the data analysis. SL drafted the manuscript; all authors reviewed the manuscript. All authors read and approved the final manuscript. All experimental methods involving animals were performed in accordance with the Australian code for the care and use of animals for scientific purposes and were approved by the Macquarie University Animal Ethics Committee (ARA 2016/032). This work was supported by the Column of Hope Research Foundation and the National Health and Medical Research Council.